Hartvig Engbretson (1845-1926) designed and built the house at 305 West Broadway, now the B & B on Broadway, in 1910 for his wife and family. Many people admired the house and its design so much that they copied it to build their own homes. Hartvig was pleased. Hartvig and Thea Peterson (1864-1929), both natives of Norway, married in Decorah, Iowa, in 1887. Hartvig served in the Civil War, was a stonemason, blacksmith, and business owner. He owned and operated the largest farm implement business in Decorah. 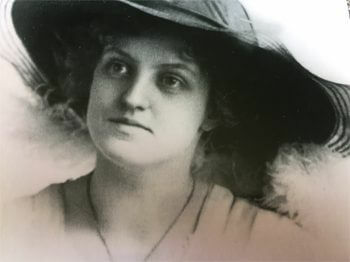 Thea was also a successful business owner: she ran the millinery for 28 years where she made hats. She had one of the finest stores in the city of Decorah on West Water Street. In the 1800s and early 1900s, dressmaking and millinery trades provided a rare opportunity for women to own and operate a business. 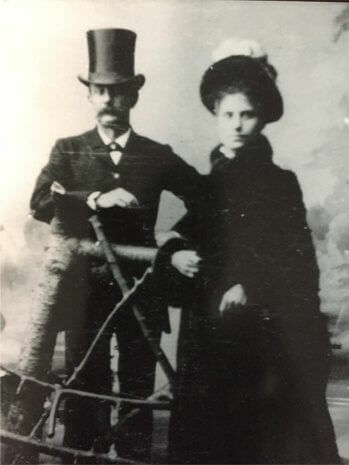 Hartvig and Thea loved Decorah and were active in the community. They belonged to the First Norwegian Evangelical Lutheran Church. Thea was active in business and social circles. She was also a member of the Ladies Aid Society for the church and the Women’s Relief Corps. Hartvig served the city of Decorah for many years as a council member. He was a stockholder and one of the organizers of the Decorah Opera House Company and a shareholder in the Decorah Value Company, the Winneshiek Hotel Company and the Decorah Gas Company. He also acquired and owned valuable realty, having built the Engbretson block on West Water Street. 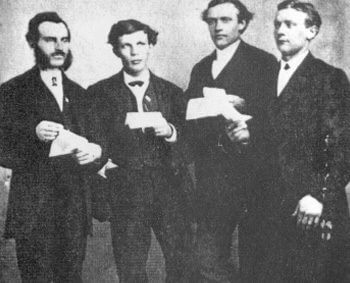 Hartvig believed in progressive policies and was a member of the political denomination, which believed in better living conditions for all. He served for one term as chair of the county republican central committee. He was a member of the Grand Army of the Republic, a member of Colonel Hughes Post, No. 138 of Decorah and served as vice commander. He was a member of Decorah Lodge No 443, BPOE. He was also active in the Decorah music scene: he was a member of the all-male quartet that became the Luren Singers, the oldest male chorus in the United States. Hartvig and Thea balanced their successful businesses, community engagement, and busy household. They had three children: Ruby, a graduate of Valder College, and a bookkeeper at Decorah State Bank. Myrtle, also a graduate of Valder College and a stenographer & bookkeeper in Freeport , Illinois. Hartvig junior, a graduate of Decorah High School, and a business owner of a John Deere Implement business with his father and Decorah’s Grand, Lyric, and outdoor theaters. We hope you enjoy the beautiful home and Decorah community that the Engbretsons helped to build. 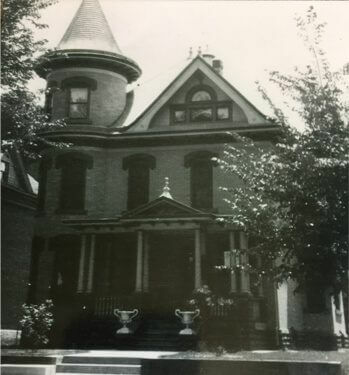 This late Victorian house showcases a three-storied turret topped by a “witch’s hat” marking it a high Queen Anne Style. The quality of the construction and craftsmanship of the house feels more like a work of art than just a house. From the firebrick and stonewalls to the hand-carved wood detail, the home features human ingenuity and nature’s materials. The exterior is entirely firebrick. Firebrick is a more expensive, durable and harder brick. It is often used for fireplace cavities. Not many houses are built of firebrick. Multiple columns, popular in Victorian houses, make up the front porch. The foundations for the porch columns are red granite, probably shipped in from neighboring Minnesota. The house extends approximately 5,000 square feet over four floors with six and half bathrooms and seven bedrooms. 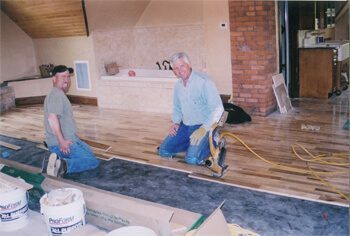 The rooms are spacious with wooden floors on three of the four floors: oak on the first floor, Douglas fir on the second floor, and Canadian maple on the third floor. Dean & Lois Humpal bought the Hartvig Engbretson mansion in 2005 and operated it as a B & B until 2016. They took the house from being a duplex, and made four bedrooms and bathrooms on the second floor. The third floor, an old ugly attic, was turned into a 700 square foot suite, complete with air jet bathtub and sauna shower. The first floor stayed as the living, dining, and kitchen area. They made major improvements of new wiring and plumbing, giving each bedroom its own private bathroom. They moved walls, painted inside and out, and installed insulation and air conditioning. They refinished floors, installed antique light fixtures, and re-landscaped the yard. They created a thriving B & B business in house they loved. On a family vacation in August 2016, Matthew and Melissa fell in love with the town of Decorah. They had been planning to leave the San Francisco Bay Area to find a place with easier access to hiking, biking, canoeing, and skiing as well as music, art, a co-op, and a vibrant community. Decorah has it all. They searched the town for a new home, admiring the architecture as they explored. 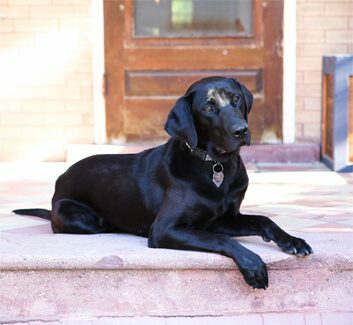 They walked into the B & B on Broadway, and even though it wasn’t for sale, thought it would make the perfect home for them, their son, Axel, and their Labrador retriever, Zoe. Matthew is a mechanical engineer: by day a rocket scientist, by night a designer of outdoor adventure gear. Melissa is a writer, educator, and innovator. She develops new and old (books) technologies for children, parents, teachers, and other adult learners. Matthew and Melissa both love living in and working on old homes. While they weren’t planning on running a B & B, it made sense. Both Melissa and Matthew like to cook and bake, Matthew can fix anything, and Melissa has experience running businesses. They are committed to local and organic foods and enjoy sharing their love for restoration and sustainability with B&B guests as well as the Decorah community. Ask them about salvage shopping, one of their favorite pass times. Matthew and Melissa remodeled the downstairs with many salvage finds to include a family room, laundry, art studio, bathroom with steam shower, two bedrooms, and a large, room-size walk-in closet. Plans for remodeling the garage to include two offices, work out area, and workshop are also underway.